I really liked Noosa when I first tried it but it's just a bit too sweet for my tastes. So we usually end up with a large container of fage plain 2% for versatility purposes. What I like about the strawberry-rhubarb Noosa is the tartness that is added with the rhubarb, which does help to cut the sweetness I find. I don't normally eat sweetened yogourt at all but do love the creaminess of Noosa I admit. However, it is very unlikely I will find it back here in Nova Scotia so I guess it will be just a southern, twice a year treat for me from now on. Thanks for the comment about the watery-ness of Liberte now, Darienne - haven't bought any in a while so will be aware next time I am in town for groceries. Greek yogourt should not be watery in my opinion - seems a bit shady to me to try to get us to pay extra for less actual product in the container. No real brand loyalty here - if companies continue to mess with consumers I will switch in a heartbeat, and pay more if I have to for a more honest, better product. We had Fage around here once but I can't find it anymore. Bummer. So, Greek Gods - Full Fat- Honey Vanilla. Great with granola. I also use it for the kids' smoothies, esp before my daughter heads off to the slopes. I swear that stuff keeps her satisfied and full of energy. Finding it with full fat is sometimes a challenge. Wallyworld is about the only place around here that provides that option. Everywhere else it's either no fat or low fat. Blah. I got desperate once, and made my own. Got half gal of raw milk, (1/4 was cream! ), followed the directions, and 24 hours later--- I was completely amazed. If I only had the time to mess with that every week! Costco has the Greek Gods Full fat here (not every time I'm there though). I freeze dried it and it was wonderful in a bark. Sadly, we don't have a Costco (or a Sam's club, or a Trader Joe's) anywhere in this area. In fact, I don't believe any exist in the entire upper peninsula of Michigan. So, for that kind of stuff, I'd have to drive a couple hundred miles to Appleton or Green Bay. So, to freeze dry it, how would you mix it in the bark? It sounds absolutely amazing! Mmmmmmmm. Essentially it's dry - so I melt and temper the chocolate and mix in the yogurt along with some freeze dried fruit. Have to post another vote for Noosa yogurt! It is very creamy. I normally don't like fruit-flavored based yogurts, but I really enjoy the tartness of the Noosa's lemon yogurt. I eat that for lunch topped with walnuts. The cherry flavor I found too sweet and for some reason my grocery store doesn't carry plain. So many suggestions for Trader Joe's Greek yogurt! I'll have to give that a try! I used Valio lactose free over here, it is really creamy and lovely. And a few months ago they two companies who make great Turkish and Greek yoghurt came out with a lactose free version, woho!. Here in Cheltenham, England i buy a Kilo pot, Milbona (Lidl own brand) full cream and Greek style. It has a good shelf life and costs only £1.20. It is delicious. I read recently that full fat natural Yogurt is not as fattening as semi-skimmed. Those of you in New York State or nearby, seek out Ronnybrook Farms yogurt. Not available in this part of New York State. Not available in my part of NY either. I think they must be another of those downstate-only things. I love Wake Robin Farm's yogurt, but since they decided not to sell at area Wegmans stores anymore because they couldn't meet production (12 Jersey cows at the farm, according to their website), it's become an even more special treat. This is very thick yogurt, and not as tart as some. I was through the container before I realized/remembered that it was fat-free. It has the same rich mouthfeel as a full-fat yoghurt. I picked up one container as a test; I'll be looking for more. Most recently I have been favoring Oomda. 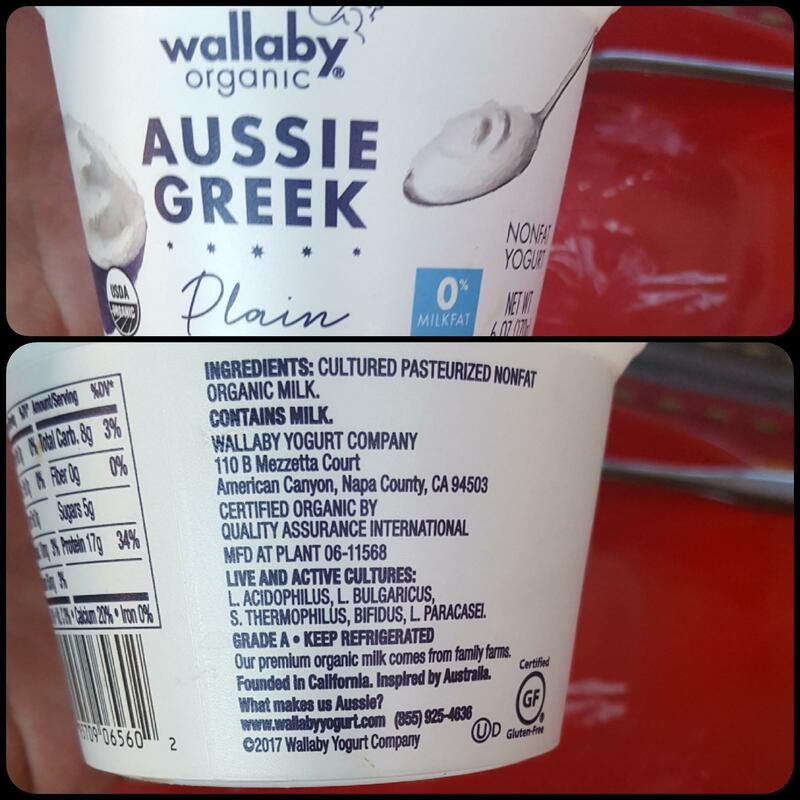 Non-homogenized Halal whole milk yogurt. Good stuff. Once you get past the "CONTAINS MILK" warning. I tend towards the ones at local Persian market. Pretty tart. They are not "pure" but I like the taste for my apps. Will post next time I get some.